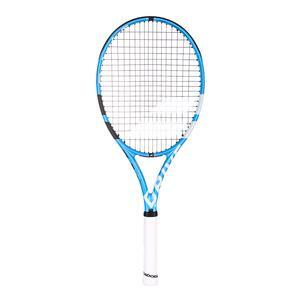 Babolat knows a good formula when it has one and the Pure Drive has become one of the most popular racquets on the planet. On a 3 year model cycle, 2018 sees the release of the latest update to this powerful, user friendly frame line. Rather than overhauling the design, Babolat has added in some important new technologies to the full Pure Drive line. The internal Cortex system is now known as Cortex Feel. It uses a rubberized material called SMAC to filter vibration and provide a cleaner, smoother response on contact. The feel of the new Pure Drive family is much more dampened than the outgoing models and long time Pure Drive players may be in for an adjustment period. The racquets also receive an update to the FSI string system. The new FSI power widens the strong spacing and uses diamond shaped grommets to elicit even more power and spin from the string bed. With a wide array of options in the Pure Drive family, it’s time to see the different options available for players. Players with advanced mechanics and those who enjoy a bit more weight in their frame will enjoy the Pure Drive Tour. At 11.7 oz strung, it is a full half ounce heavier than the standard model. This equals ball crushing power from the baseline and supreme stability for absorbing pace. The 100 inch head size provides an ample sweet spot while still feeling maneuverable. 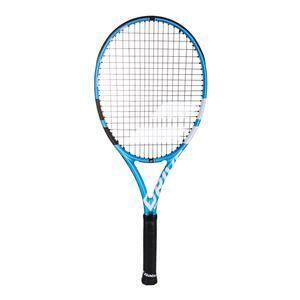 The 16 x 19 pattern and FSI Power system provide impressive levels of spin on groundstrokes and serves. The frame is still headlight enough to whip through contact and dial up heavy shot making. Also available is a Tour + model which has the same specs, but adds a half inch of extra length. The added length provides more leverage and reach on groundstrokes and serves. It also raises the swingweight for a little bit of extra pop on your shots. Whether you like extended or standard length frames if you hit big, the Pure Drive Tour models are tailor made for you to dominate from the baseline. 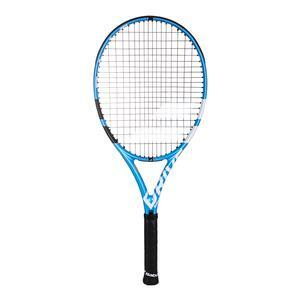 Babolat’s bread and butter is the standard Pure Drive model. Clocking in at 11.2 oz strung, the Pure Drive offers readily available power at the baseline but is fast enough to transition quickly to the front of the court. Cortex Feel provides a much more dampened feel than models past, making it more comfortable on contact. There is a noticeable increase in spin production from the FSI Power string bed and players will have no problem loading their shots with pace and spin. For fans of extra length, the Pure Drive + adds a half inch of length to the specs of the Pure Drive. This provides additional leverage for driving the ball through the court on serves and groundies at the expense of a little maneuverability. Both models are exceptionally stable for their weight, allowing them to match up at any level of play. Juniors and developing players have some lighter versions to pick from. The Pure Drive Team lowers the weight to 10.7 oz strung, giving excellent speed for adding pace to the ball with ease. 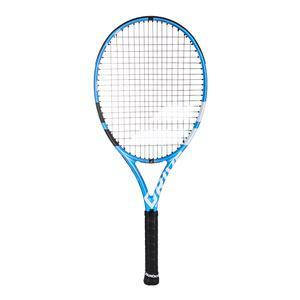 The headlight balance maintains maneuverability at the net and there is plenty of spin from the FSI Power 16 x 19 string pattern. Those that need the ultimate in lightweight power will want the Pure Drive Lite. 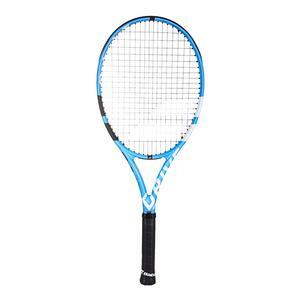 At 10.1 oz strung, it is incredibly free swinging and will bring pace to compact strokes. The closer to even balance helps ensure a healthy dose of both power and stability. The Lite shares the same spin friendly nature as the rest of the family. The Team and Lite models make strong choices for anyone with developing game that still wants to play with plenty of offensive firepower. For those who need a bit more forgiveness and hitting area, there are two oversize Pure Drive variants. The Pure Drive 107 offers plenty of forgiveness and power from its 107 inch head size. At 10.7 oz strung, it is capable of putting plenty of heavy power on shots and has outstanding spin production. The 107 is also slightly extended, providing additional leverage on shots and more reach when forced to play defense. The largest member of the family, the Pure Drive 110 offers top notch power and comfort. The 110 inch head has a generous sweet spot and the 9.6 oz strung weight makes it lightning quick to accelerate for pace and spin. 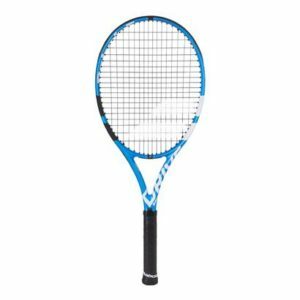 Extended to 27.6 inches long, it also has tremendous reach and additional leverage for driving groundstrokes and serves through the court. Babolat has cemented another brick in the Pure Drive’s outstanding legacy with this new update. Boasting a cleaner, more player friendly feel and more power and spin than ever before; this update is sure to be a best seller. With the multitude of options allowing Babolat to have a frame for every type of player, don’t be surprised if the next time you are on court, you’re surrounded by 2018 Pure Drives.